The Duck-Rabbator Dopplebock is a powerfully malty German-style lager. The malty / grainy flavors so dominate this beer, it's like a whole loaf of bread in every glass! Is it a beverage or is it a meal? It's both. On tap into a snifter. Deep brown color with a modest off white head. Malty aroma with hints of raisin and caramel. The taste followed closely. Rich bready malt with some spiciness and caramel notes. Clean and dry on the finish. Medium bodied and easy to sip. 12 oz bottle poured into Thulsa Doom. The deep toffee-caramel color on this is just amazing. It reminds me of caramel apples. Strikes of light coming through the sides, with a 1/2 finger of head resting stable at a fingernail. Lots of gorgeous aromas here. Caramel-glazed fig, toffee-covered raisins, slight red grape/merlot, apples, hot caramel topping, light tobacco, light chocolate. Flavor is spiced, hot, and fruity. Not nearly as good as the nose though. It comes rushing with alcohol burn, then some carbonated water, red grape, banana bread/dark rye bread, spices, lite caramel, light brown sugar, ending with some heavy vegetal off-flavors. Feel is thick and chewy, with a good burn and a nice thick starch on the finishing palate. Overall, really great up until the flavor where it falls a bit flat for me. Definitely worth checking out though, I can be picky sometimes. Today was one of those days that are simply unquantifiable. Yesterday, I left my worksite utterly enervated as the result of the start of DST, came home & promptly crashed out. Today, I found myself energized upon my return home & decided to indulge in some beer. Some heavy-duty beer. C'est la guerre! From the bottle: "Made in Farmville, North Carolina"; "Proudly hand made in small batches"; "The Dark Beer Specialist". I Pop!ped the cap on this bad boy & knowing that it had some age on it (Best before 05/17), I poured slowly & gently, leaving a good bit still in the bottle. Once I was satisfied that it was properly & sufficiently decanted, I went with a vigorous in-glass swirl to raise two fingers of dense, foamy, deep-tan/light-brown head with modest retention. Color was Dark Brown to Very Dark Brown (SRM = > 27, < 34) with NE-quality clarity & mahogany highlights. Nose smelled of leather, dark chocolate, treacle, anise, earthy malts & burnt caramel. I was reminded of an aged English Barleywine! Mouthfeel was big & full, like a dollop ladled onto my tongue. The bottle's label may have indicated that I over-aged it, but I don't think so. The taste was not at all sweet, which I would bet was not the case when fresh. Instead, it had a very leathery, treacle, earthy malt-forward quality, underlain by dark chocolate & burnt caramel. OMFG, but this was eminently drinkable at this point! It had almost NO residual sweetness & was as good as an English Barleywine that I had tried. I am happy to try a fresh bottle for comparison, but I have a feeling that this was more to my liking. Finish was dry with a lingering burnt caramel flavor, accompanied by the earthiness of the malts. I could totally see this as a loaf of baked bread. 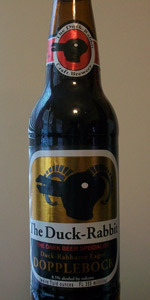 Appearance - The beer poured a deep murky brown color with an off-white colored head. Smell - The nose was radiating with dark sweet bread notes. Taste - At the front, Brown sugar came through with and almost soy- sauce like impression. Then came the dark ready malts. This is a beer that eats like a meal. The chewiness continued into the aftertaste. Mouthfeel - Rich, malty, and almost chewy, per the style. Overall - Though not necessarily an elite version of the style, this is pretty solid and perhaps even high end. The Duck-Rabbit Craft Brewery "Duck-Rabbit Duck-Rabbator"
Notes via stream of consciousness: It's poured for me a clear but very dark brown-black. I'd guess it to be about 31 SRM. It's short head of tan has already dropped, leaving just stops of lacing behind. The aroma is quite richly malty with notes of caramel, grain, and a light bit of dark-skinned fruitiness. Ahhh, the flavor backs that up but it's not as rich as I'd have thought it would be, nor is it as sweet, and there's an added note of black tea that's interesting. Also, the fruitiness that I found in the nose to be a bit like raisin is not as intense as I'd suspected, and there are some other fruits like apple and orange in play as well. And finally, there's a light bit of smokiness in the finish, and I hate to say it, but a touch of soy sauce as well. This is a unique bird, err, duck-rabbit to be sure. It still follows all of the rules of the style though, and it's almost compellingly drinkable. How strong is it? 8.5%, OK, that's workable - I just didn't want to find out I was chugging away at a 10 percent-er, that could be dangerous! So what did I miss? Body: medium-full. Carbonation: moderate with very fine bubbles. I think it could use a touch more gas but it's OK as it is given the style, it makes it all that much smoother. Overall it's very nice. It's not as rich as some of the best known examples, but it's satisfying, and it's got some unique characteristics to it that give it charm. I'd certainly call it "worth trying" and suggest it for malt heads and those who love dark beers. Pours a murky brown producing less than a finger of light tan, finely bubbled, rapidly diminishing head that leaves little lacing. Aroma is dark bread, toffee, brown sugar, raisins, some vanilla, milk chocolate & cream, faint banana. Taste is sweet, dark bread, milk chocolate & toffee, dark fruits especially raisins & figs with some hop character & a peppery spiciness in the fruity, toffee & lightly boozy finish. Sweet start, slightly dry finish. Fruit & candy mix with some hop bitterness that is accentuated by the alcohol bitterness, spice & warmth to make up the aftertaste. Mouthfeel is medium bodied with light-medium carbonation, smooth & creamy but with a fine spice in the latter half of the sip. Mild aroma, Pours an opaque dark brown. Decent head dissipates quickly. Chocolate overtones with a mild bite. This is an easy drinking doppelbock that is a good representative of the style. Well done. Pours clear, mahogany in color with 1/2 inch head. Taste is caramel, dark bread, and some dark fruit. Medium-heavy bodied and sweet. Nice American dopplebock..I prefer German versions of the style, but this is well worth a shot. Look - a deep mahogany with a small khaki head and no retention or lacing. Smell - malty sweetness in the form of caramel, dark fruits, and sweet bread, some booze, and some subtle hints of chocolate malts. Taste - follows the nose with caramel, dark fruits, and sweet bread standing out most. Feel - surprisingly thin, a little slick, low carbonation. Overall, the dark fruit notes make this especially enjoyable (bordering on a barleywine or old ale), but the mouthfeel is very disappointing. This beer could be top-tier if it was chewy and more effervescent. Small head,off white tight bubbles. Aroma definitely warm alcohol with dark fruit in background. Also some caramel malt. Taste similar to aroma. Also good malt sweetness and complexity. Slight hop bitterness and roast in finish. Good solid example of a dopplebock! Pours a very dark brown liquid from the bottle with yellow highlights, practically no head to speak of and definitely no lacing. The odor was truly special, a good mixture of honey, hops, and some caramel notes. It really was what made this brew particular distinctive. The feel was a tad more carbonated for my taste, but the creamy and smooth texture more than made me forget about it or rather just ignore the fact. Overall, I was truly surprised, this is a very distinctive beer, not quite like anything I have ever had to date. This brewery has certainly been full of surprises - and good ones at that. Flavor – slightly sweet, slightly caramel malty; no hop or malt bitterness noted but an odd organic chemical is perceived. No hops flavor or aroma. No diacetyl.